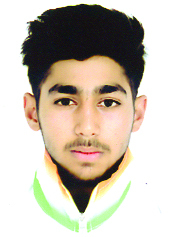 Born on December 12, 1998, Vansh Mahajan is an ace fencer of Jammu and Kashmir State. He alongwith another gritty fencer, Teja Singh represented India in the International Fencing Championship (Junior & Cadet Commonwealth Fencing Championship) at Cape Town in South Africa. Vansh has the honour of winning a galaxy of medals in the National Level events. He won silver medal in XIII Sub Junior National and Cadet National Fencing Championship way back in 2011 at Kolkata, besides winning bronze medal in the 58th National School Games 2012-2013 at Jalgaon in Maharashtra. This gutsy fencer won bronze medal in the Cadet National Fencing Championship held at Bhilali in Chhattisgarh in the year 2015. He has the distinction of winning bronze medal in Junior National Fencing Championship held at Chhattisgarh. Apart from winning medal at the National Level, Vansh has won series of medals in local championships including District and State Level Tournaments. He won gold medal in 11th Jammu District Fencing Championship in 2012 and also clinched a gold medal in Inter-District Fencing Competition, organized by the Department of Youth Services and Sports at MA Stadium in Jammu. Vansh also won gold medal in District Fencing Championship held at MA Stadium in Jammu from June 1 and June 2, 2015 at MA Stadium, Jammu. He was selected for National Coaching Camp at NSNIS, Patiala prior to participation in Commonwealth Games. 1. By how many wickets India lost the 1st T20 match of the ongoing Series against Sri Lanka? 2. Who is the general secretary of Hockey J&K? 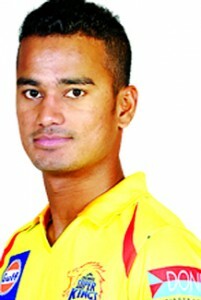 3. Who was awarded man of the match in 1st T20 match of the ongoing India-Lanka Series? 4. Which two teams qualified for the knockout stage of the Santosh Trophy at GGM Science College Football ground recently? 5. Who is Pawan Negi? 1. 7 wickets 2.- 3. Shane Watson 4. 12 matches 5. Member of Team India T20 squad. The best entry of this week was received from Sunil Sambyal from Samba. The other entries of the week were from Sanjay Dhar, Lane No 1, H No-3, Upper Laxmi Nagar, Sarwal, Jammu; Sourav Chopra, 126 Bakshi Nagar, Jammu; Ajay Sharma, Sunderbani, Rajouri; Aryan Dogra, Talab Tillo, Jammu; Arun Kumar, New Plots, Jammu and Amarjeet Singh, Ghou Manhasan, Jammu.